There’s a subgenre of crime films that linger over their characters, whose plots move slowly at first, but gradually become increasingly tense until the final confrontation is not only inevitable, but startlingly intense. 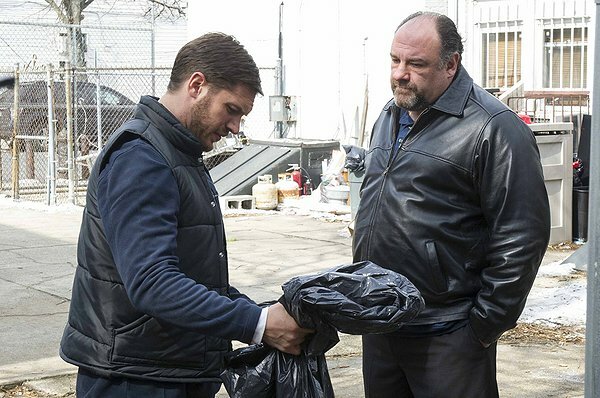 “The Drop” is a shining example of this genre, and it seems a fitting final cinematic role for the late James Gandolfini, who gets to showcase both his sense of timing and his ability to layer complexity into seemingly simple characters. The film rotates around Bob Saginowski (Tom Hardy), a bartender who tries to hold himself aloof from the organized crime that surrounds him. Cousin Marv (Gandolfini) used to own the bar where Bob works, but now it’s owned by a Chechen crime family. The Chechens periodically use it as a “drop” – a place for their people to drop off the large amounts of money that change hands in the city. Marv still runs the place, and gripes over the glory days he used to have, when it was his bar and he was somebody. As the police investigate the robbery, they begin finding threads from the past – a decade-old murder, other organized crime before the Chechens moved in, and so on. Bob keeps insisting he’s just a bartender, he’s not in the life anymore, but he’s not only surrounded by organized crime, he’s largely unafraid of it. The acting is phenomenal, and aided by a wonderful script (written by Dennis Lehane, based on his short story “Animal Rescue”). Bob is a deceptively simple character – Hardy’s performance will reward multiple viewings. Rapace makes her character likeable and understandable in spite of what might be considered flaws. We can see what Bob sees in her, even if nobody else seems to. Gandolfini’s performance is excellent, and he’s given a character who, like Bob, is more than he seems. He pulls it off with panache. There is violence here, but it’s the low-budget, mostly-implied type, and there’s little enough in the film that when violence does occur, it’s more than a little shocking. “The Drop” is as much a character study as a crime drama, so if you’re looking for gun battles and fist-fights, it is not for you. If you like films that are more about people than about events, if you like plot arcs that consist largely of learning more and more about a small group of people interacting, do not miss “The Drop.” It got very little publicity, and will probably only be in theaters for a few weeks, so catch it while you can.